After a bloody conflict that saw insults lobbed, terminal illnesses wished for, and YouTube’s down-thumb button bashed so relentlessly that it may never recover, the long-simmering war between late night talk show host Jimmy Kimmel and the vast group of video-game watchers known as the Let’s Play community may finally be coming to a close. Kimmel attempted to bury the enchanted diamond pickaxe with the amorphous people mass during last night’s episode of Jimmy Kimmel Live!, airing a segment where he sat down to talk with popular gaming streamers Markiplier and MissesMae (a.k.a. Mark Fischbach and Jonna Mae). Besides watching MissesMae’s parents freaking out on an Occulus Rift roller coaster and showing off Kimmel’s complete lack of skills at car-soccer sensation Rocket League, the trio also discussed the various threats and insults that Kimmel has been enjoying ever since airing a segment last week mocking the Let’s Play phenomenon. Kimmel’s initial poking of the great subscribing bear was directed at YouTube’s new Gaming platform, the Google-owned company’s answer to Twitch. (For the uninitiated, Twitch is an online service that allows people to play Pokémon and Dark Souls at never-before-witnessed levels of inefficiency and sloth.) The comedian’s basic point was that watching other people play video games, instead of just playing them yourself, was kind of dumb. The internet, displaying its customary maturity, fired back that, on the contrary, it was Kimmel who was dumb, and also that he should get AIDS. And so, one of the great mental chess matches of the 21st century was birthed. 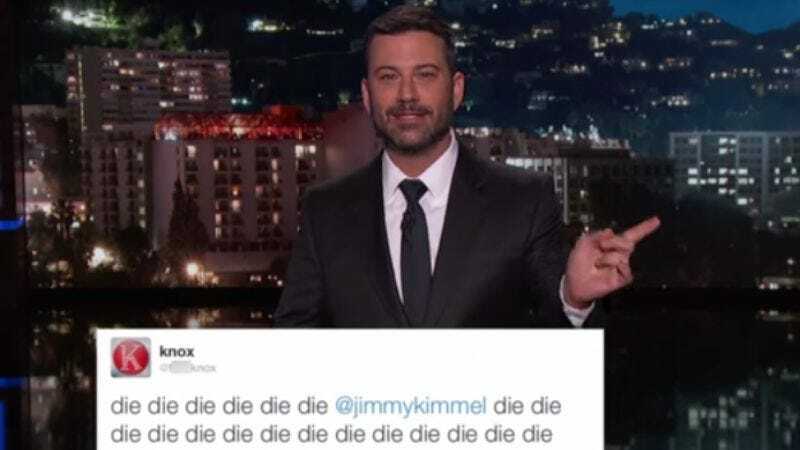 Since that first segment, Kimmel has aired multiple pieces highlighting the worst of the invective hurled at him, clearly enjoying the irate accusations that he’s a “bellend” into whose mouth the assembled horde would like to defecate, while continuing to stoke the fires by jokingly threatening to use his powers as a talk show host to get the phenomenon shut down. His bemusement at requests that he develop cancer and then die has made for pretty consistently amusing TV, even if his apparent unfamiliarity with the common internet greeting hints that he might actually be out of touch with the online world.